Bob Taylor is an unusual fellow. As soon as he comes up with a really cool method or process to improve his guitars, he shares it openly with other guitar makers, including his biggest competitors. This is pretty strange behavior, considering that the leading manufacturers in most industries try to keep any proprietary method a big secret so they can stay ahead of the others. It's been a long time since Bob Taylor was an young guitar maker building instruments one at a time. Now, he's an industrialist. His factory employs hundreds, and makes thousands of guitars every year. Through all the growth that has brought the company this far, Bob has never lost sight of an important guiding principal: Every time you increase production, you must also make a significant increase in quality. When we hear of a manufacturer upping production, our gut reaction is to presume that quality will drop and service will go out the window. You know, the same stuff we all hate about bank mergers. But not so with Taylor. When they moved into their new factory, we wondered where they would find room for improvement in the guitars. Right at the old neck joint. First, let me give you some background. Guitars are made of two major parts, the body and neck. How you stick those two parts together has become something of a controversial topic, thanks to one Bob Taylor. He founded Taylor Guitars with the idea of bringing innovation to the methods of construction of a traditional instrument. Specifically, he popularized the concept of bolting the neck to the body rather than gluing it on. A bolted neck can be removed easily for repair. It's simple as that, and because guitars change over time, it eventually becomes necessary to remove and realign the neck to correct for eventual changes in the shape of body as a result of string tension. At a time when all the big manufacturers of quality guitars were using a glued dovetail joint, Taylor bolted his necks on. The success of Taylor instruments has certainly proven that a bolted neck is a solid concept! In fact, it's now considered by many, if not most guitar makers to be a standard neck attachment method because it's easier to do, works as well, sounds as good, and facilitates repair. Now Bob's attacking this area from a new perspective. Having licked the neck attachment issue, he's actually looking at the "tongue" of the fingerboard that sits on the top of the guitar. Here's the problem. You get the neck aligned correctly to the body, but the end of the fingerboard may not be in a direct line with the rest of the neck. Sure, you can correct for that during manufacture, and most builders do just that. But, what about later, as the guitar ages? The neck pulls upward at the body, eventually reaching the point where it needs to be reset to the original angle. Then, you remove the neck, change the angle, and reinstall it. Oops! 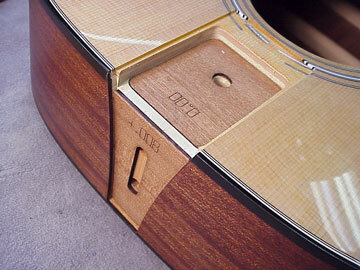 The fingerboard still has to be glued to the top of the guitar. You can shim it up if it appears to "droop" at the body, or you can just leave it that way. After all, playability above the 14th fret isn't that big a deal, right? In generations past there have been any number of patented attempts to resolve this issue with guitar necks that pivot at the body, with elevated reinforced fingerboard extensions which move with the rest of the neck. All these methods had one big flaw. They looked funny, and they looked (or were) unstable. 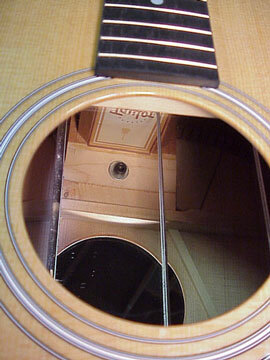 I've laid a mirror inside this guitar so you can see the single bolt under the end of the fingerboard. The label, upside down because you're seeing it in the mirror, hides the bolts that hold the neck in place. 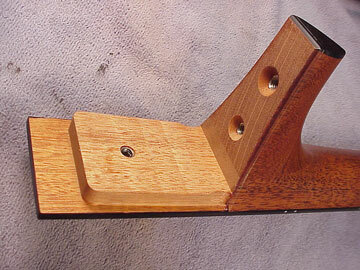 Notice that the end of the fingerboard is supported through its entire length by an extension of the mahogany neck. 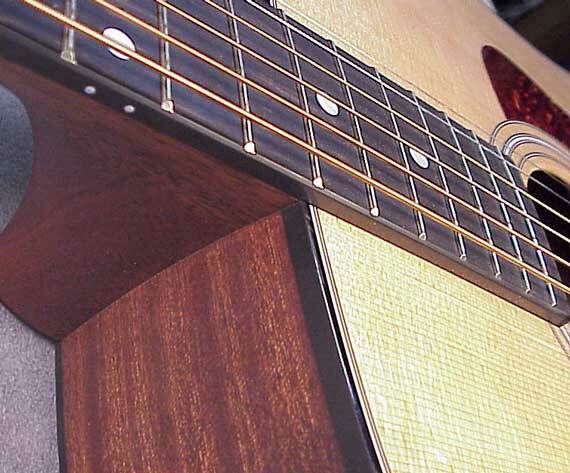 In fact, the entire length of the neck, from nut to 20th fret is made from the same piece of wood to ensure stability. The end of the neck is mortised into the sides of the guitar, and the end of the fingerboard is mortised into the reinforced top. The end of the neck is mortised into the sides and neck block. 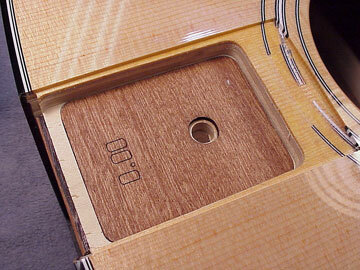 The end of the fingerboard and its extension support are mortised into the top. Now, this, in itself, is not such a big innovation. The Martin guitar company made instruments with necks mortised in exactly this way, before the Civil War! Those necks attached with a bolt that was accessible from back of the heel, allowing the neck to pivot and be adjustable without even removing the strings. These necks were not solidly mounted to the body, so the joint was easily damaged. Of course, these were all gut strung guitars, so I suspect that the tension of steel strings would be too much for this kind of neck joint design. 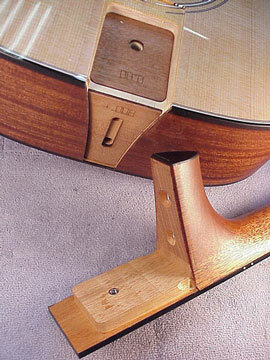 Another old timer with a similar pivoting neck system was the Howe Orme guitar. Click here to take a quick look at Rick Turner's collection of Howe Orme instruments. OK, so Bob Taylor didn't invent the idea of a bolt-on neck, and he didn't invent the idea that the fingerboard should be supported so it can pivot with the neck. What's the big deal then? The big deal is that he came up with a way to make the system work with steel strings, and to make it as solid as a fully glued up neck,fingerboard and body assembly. And he made it all go together so you can't even see how he did it without taking everything apart! 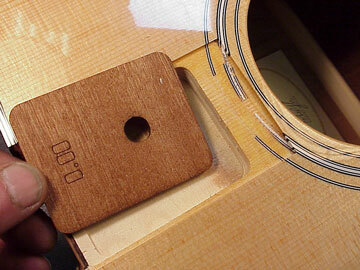 As with so many other aspects of the Taylor guitar, the key to the system is precision woodworking. First, take a really close look at the neck joint from the outside. See what I mean? Even if you really zoom in, you simply can't see that the fingerboard is actually set into the top. 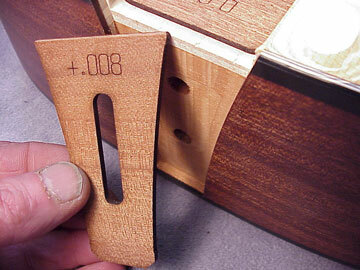 The clearance around the entire neck and fingerboard is a maximum of 0.002 inches. That's only a hair at the most! Fitting thousands of necks with this kind of precision means using computer guided equipment and very tight quality control indeed. The big computer controlled milling machines make the work go quickly, too. It turns out that the heel fits so precisely that the finishing department must be very careful, because just an extra coat of finish will interfere with the neck installation. The perimeters of these shims are laser cut with precision, so they simply drop in place and stay there without falling out while the body and neck are assembled. So, here it is. Another innovation that makes the assembly of guitars even faster and easier. We luthiers have to remember that this is all industrial process. 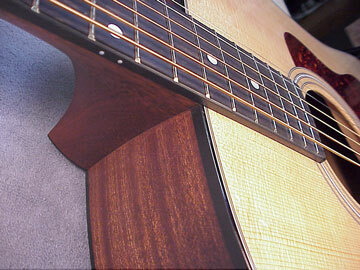 That means it is great for production work, but not the essence of traditional hand made acoustic guitars. I believe there's also a place for traditional design and craft in this business, and there will always be serious musicians interested in truly hand crafted instruments.